Under Renovation, all new bathrooms and pictures to come! getaway, comfortably appointed for a beach lifestyle, with ample room for everyone to enjoy. of the house with a full dining table and chairs, ideal for a family dinner or a picnic lunch. picnic table provides a refreshingly casual dining area. bedroom and queen-sized bedroom sharing the hall bath, outfitted with plentiful counter space. shower/tub combo accents this level of the home. location for unwinding after a long day out in the sand and sun. *The Homeowner's Collection Spring Fever Special is available for stays from 3/8/19 - 5/22/19. Limited availability and not applicable to existing reservations. Additional restrictions may apply; fees & taxes are excluded. These specials cannot be used in conjunction with other offers, are based on availability, and some restrictions may apply. Available on participating cottages only. Subject to change. An exclusive vacation experience brought to you by the homeowner's of Seaside, Florida. Seaside, Florida...a beautiful coastal community where old time values still apply. Where kids can be outside and enjoy the sunshine and adults can relax and enjoy the beautiful beaches and town. Seaside offers three swimming pools, six tennis courts, croquet lawn, well equipped fitness center, nature walks, bicycle rentals, shopping and so much more. Our cottages have all the charm and space you'll need for a weekend getaway or a week stay. Homeowner's Collection-Where Your Story Unfolds! House in need of redoing except for living area .carpet in one bedroom smelled Of urine.kitchen terrible ,lacking much .bathrooms in need of gutting .porch furniture dirty . Thank you for taking the time to provide this review. We will do a complete inspection of the property and address the items relative to cleanliness immediately. The owner does plan to do some renovations on the bathrooms in the near future. We will also inspect the kitchen inventory. We are very sorry that you experienced these inconveniences during your stay. Great house for a family, perfect location! Have stayed here several times and will do so again. Thank you for taking the time to provide this review. And, we appreciate you being a repeat guest! We hope to welcome you back to Seaside and Floridays again very soon. We loved our time at Floridays. It's not fancy like some of the newer properties, but the furnishings were new and beautiful and the kitchen has everything but a steamer. We loved the floor level and upper patios. The location, especially if you have kids, is close to the beach, pool and green space. Maintenance was very responsive and several things were newly updated (grill and fan). We would happily stay here again. I would love if you added an outdoor shower, but the hose helped a bunch. Thank you so much for taking the time to provide this review. We will share your recommendations on the steamer and the shower with the owner. As you note, they have been on the move with updates and will appreciate your thoughts. We hope to welcome you back to Seaside and Floridays very soon! The location is perfect! 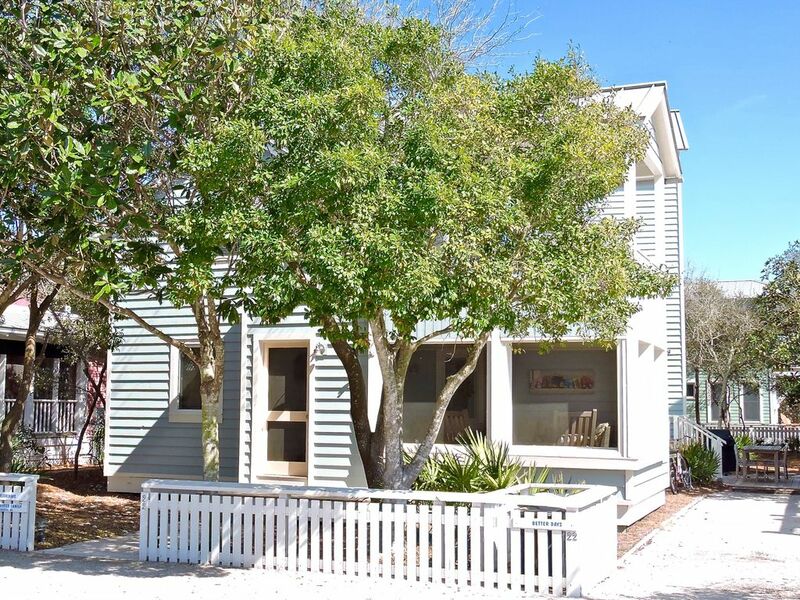 Right across from beach access and easy to walk to town center. The third floor bath and room it is above are extremely hot. There is no air conditioning in this area of house. The town imposed an 8:00 curfew during spring break that we were not made aware of until the kids were run out of town by police. The police treated every kid like they had been drinking or partying. They were abrasive and called them delinquents for standing near the food trucks at 8:10. I do not recommend this area for spring break with responsible teens. Verizon does not work in the house. Wifi is great but all calls cut out unless you walk to the corner. Otherwise, the location really can't be beat and the rest of house is very comfortable and well furnished. We enjoyed the screened porch and sundeck and the grill. Also available: Croquet. Volleyball and Badminton. Basketball court and Pilates & Yoga room. 50% Deposit is Required at Time of Booking. Balance is due 45 days prior to arrival. Cancellations permitted prior to 45 days of arrival. Please refer to Homeowner's Collection policies and procedures.